Not many drinks are as purplish as this drink. 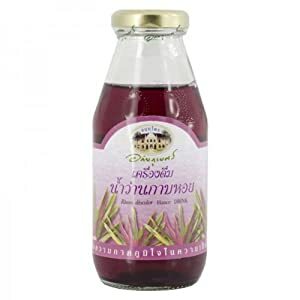 If you thought that Ribena is purplish, when you put Ribena next to this drink, you will know that Ribena, a black-currant juice, is not purplish but slightly reddish like the Rosella drink as mentioned in this post here. This drink really looks attractive and mysterious. It resembles certain drinks that were full of magic spelling prepared by a witch! 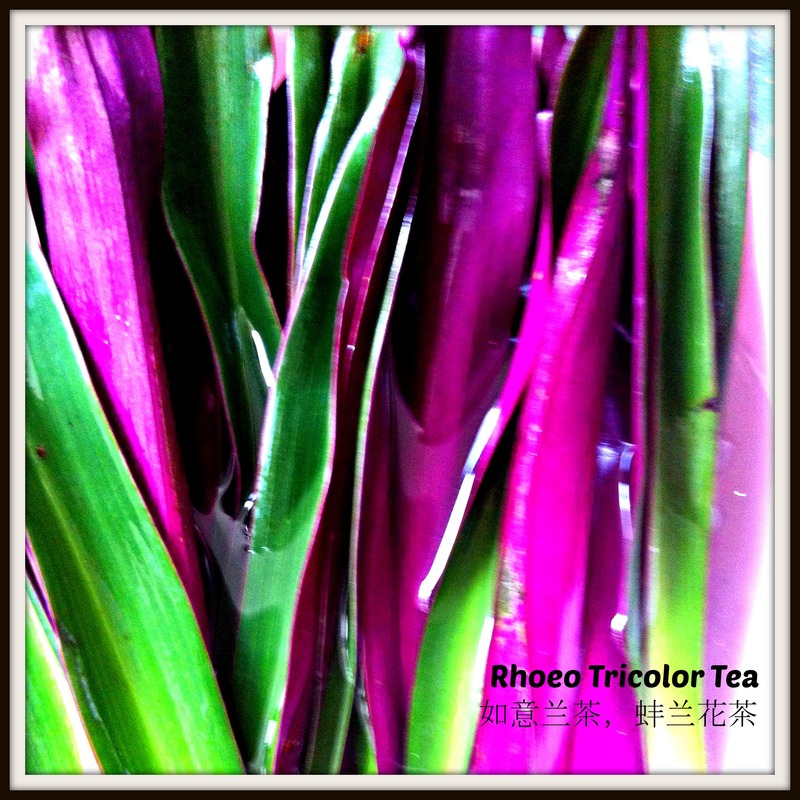 However, I love the unique flavor of the drink and this is the Rhoeo tea/tonic or drink. Most people may not be familiar with the name “Rhoeo” but it was sometimes called Oyster Plant, Moses in The Cradle, boat lily. In Chinese, it is called 荷包兰、青红兰、红竹叶、如意兰、海蚌念珠、蚶花，蚌兰叶、红蚌兰叶、紫万年青、紫蒀、紫兰、红面将军、血见愁 and commonly planted in the house. 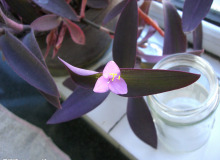 Tradescantia spathacea, or Moses-in-the-Cradle, is an herb native to Mexico with fleshy rhizomes. It has rosettes of waxy lance-shaped leaves. Leaves are dark to metallic green above, with glossy purple underneath. These will reach up to 1 foot (30 cm) long by 3 inches (7.5 cm) wide. They are very attractive foliage plants that will reach 1 foot (30 cm) tall”. For my readers who are Chinese speaking, I have specifically include this excerpt. Note that the Chinese and English versions are not the same as they are from the different source. Now you know what is an oyster plant or Moses in the cradle or 蚌兰花 or 荷包兰! 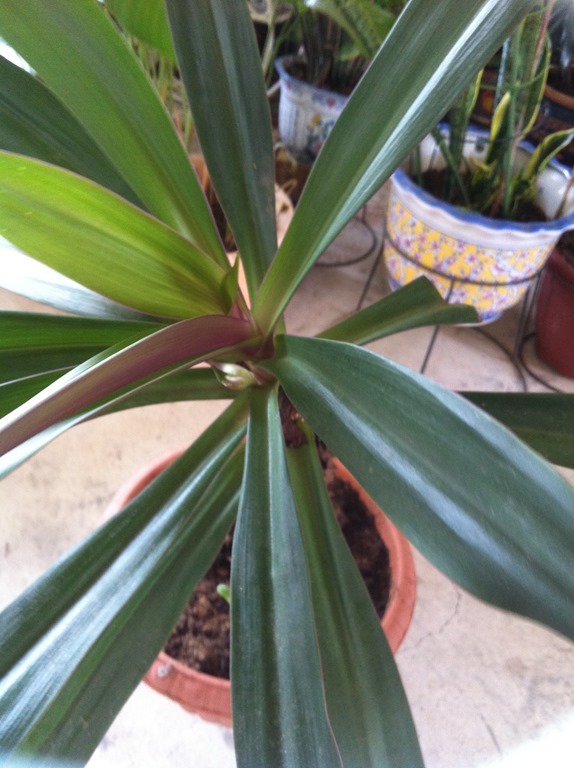 The last picture is one of my house plants planted by my mother in law when she stayed with me. My mum in law and my mother used to boil this drink. This herb is very popular in the Southern part of China. As I said above, I just loved the unique flavor that it gave rather than its color. Again, when I saw this in Wet Market, I just grabbed some and boil the drinks for my family. 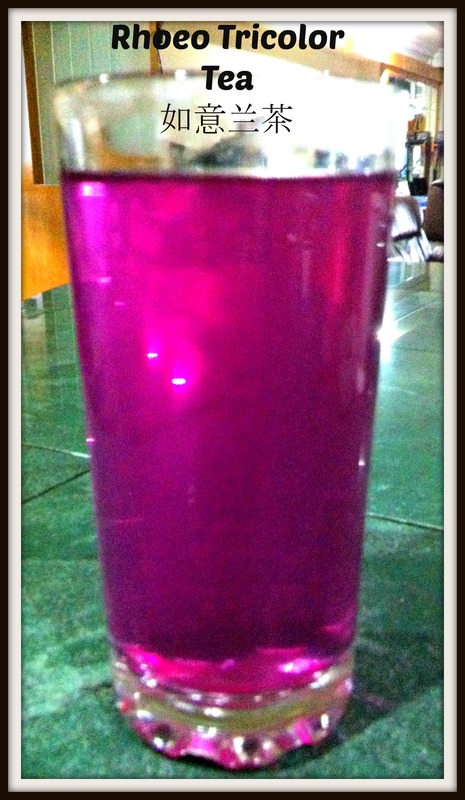 As Rhoeo by itself is rather plain, I have added purple sugar cane to partly sweeten the drink. Both “purple” color plants are believed to have cooling effects to our body. 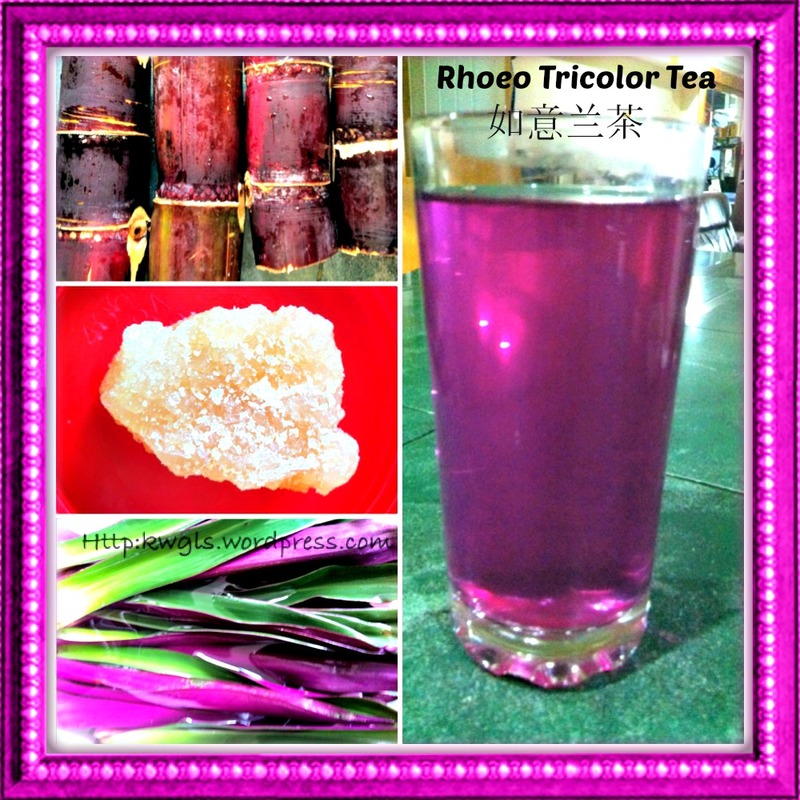 Rhoeo is a good thirst quencher and according to Traditional Chinese Medicine, it is believed to be good for cough, cold, coughing phlegm with blood, whooping cough and nose bleed (read the Chinese definition above.) Worldwide, studies have been conducted to study the flower’s antitumor / chemoprevention properties, anti-genotoxic, antimutagenic activities and antimicrobial / phytochemical constituents. 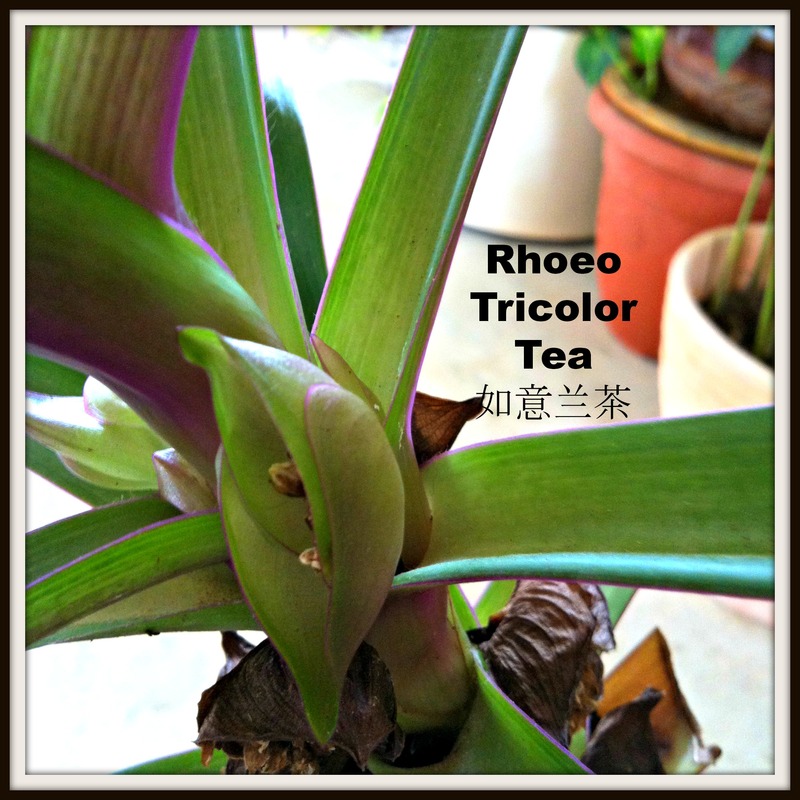 Rhoeo Discolor (about 250g), purple cane (about 250g), white or brown or rock sugar (250g), water. All these measurements are for reference only. If it is too sweet for you, please dilute with water. Personally, I prefer to have a more concentrated drink and dilute it with plain water when the need arises. Purple cane is optional. There are households add in candied water melon (冬瓜条). As rock sugar is considered as cooling, therefore, most recipe will call to use this form of sugar. However, if you boil a big pot (say 4 quarts), you will need a lot of rock sugar and it can be rather costly. Personally, besides using rock sugar, I have add in granulated white sugar also. 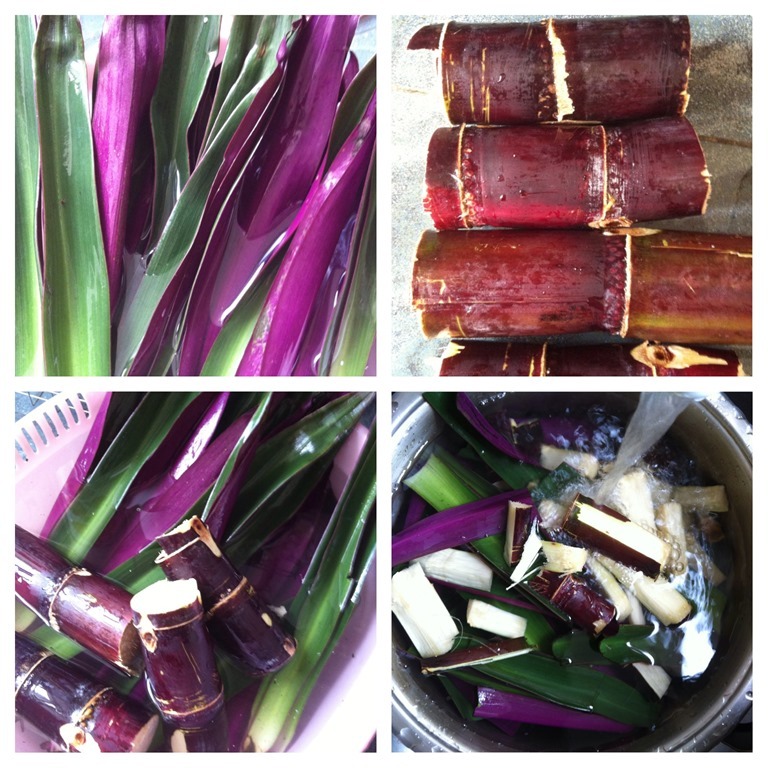 Wash the Rhoeo leaves and purple canes and cut the purple cane into smaller pieces (in the second and third picture). Note that both the Rhoeo leaves and purple canes can be rather dirty. 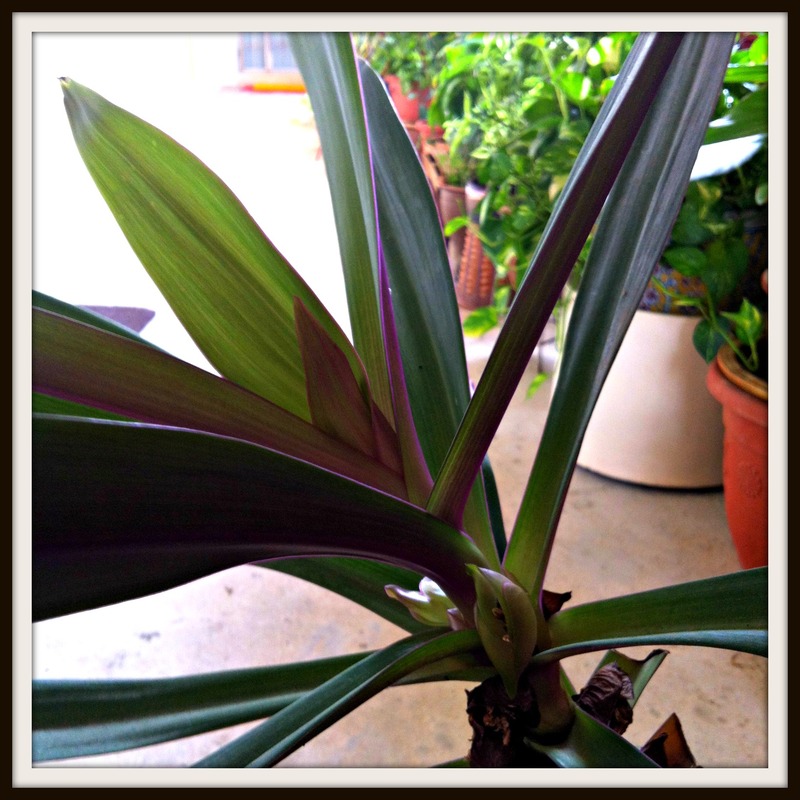 I have used a new sponge to clean the leaves and certain types of formations in between the joints of the purple cane. Throw everything into a pot of water and bring to boil under high heat. Note that before boiling, the water is colorless. When it boiled, bring the heat down to slow and boiled for about 30 minutes. Add in rock sugar or granulated sugar that is done. The drink is ready. The 1st picture is before boiling, the 2nd process in the process of boiling and the third picture the drink after cooked. 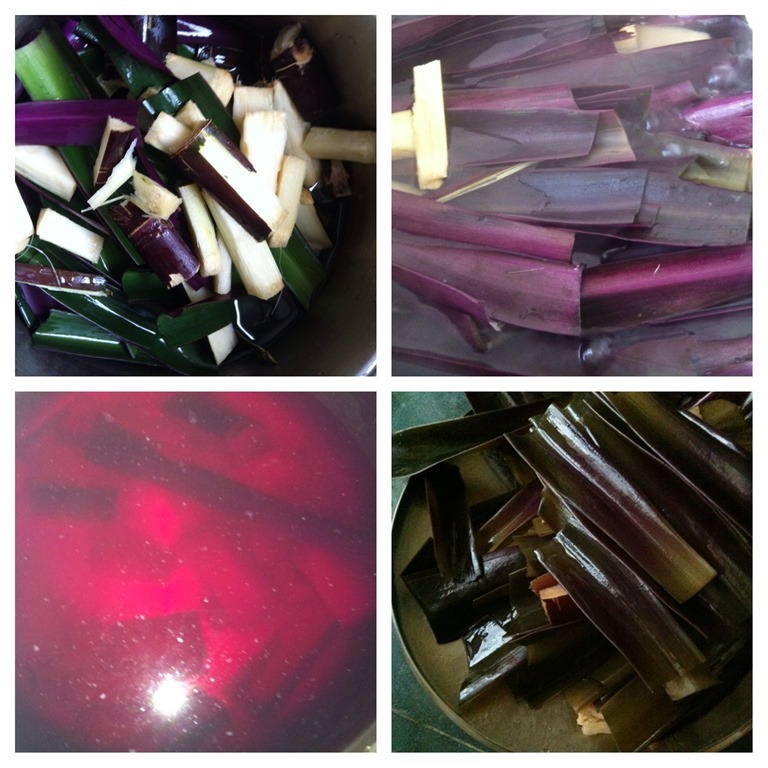 The 4th picture are the leaves and the canes after boiling. I will throw away the leaves and keep the purple cane. The purple cane can be munch again and sweetness is still there. NOTE: DO NOT THROW AWAY THE PURPLE CANE. 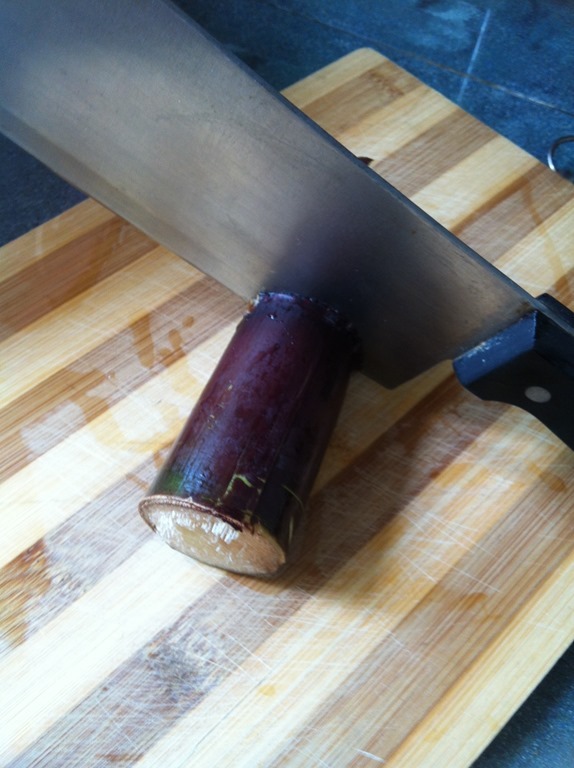 The purple cane can be munched again and there will be still juices flowing out since we only boiled for 30 minutes. SERVING – As this is considered as an herb or tonic, we don’t usually serve it cold. We usually serve it when hot or at room temperature. 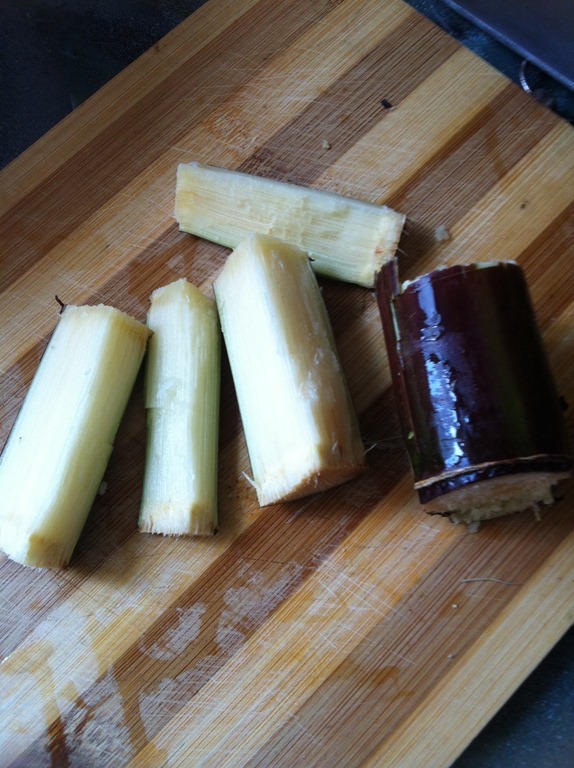 VARIATIONS – You can add in winter melon candies or substituted purple cane with normal sugar cane. Just boiled the leaves alone is definitely acceptable. The name oyster plant should not be confused with another oyster plant, salsify and the Chinese 红竹叶 belong to another plant though it was used interchangeably. Also called oyster plant – Salsify plant Also called 红竹叶and function is quite the same. This plant thrives well in the climate and various types of soil conditions in Singapore and Malaysia. It’s easy to take care and can use it both inhouse and outdoor plants. It had beautiful white flowers that can light up your day. Why not plant some in your apartment or landed properties and “prune” it for when you are thirsty? Lastly, let’s look at what I have found on the internet. Thanks for reading. 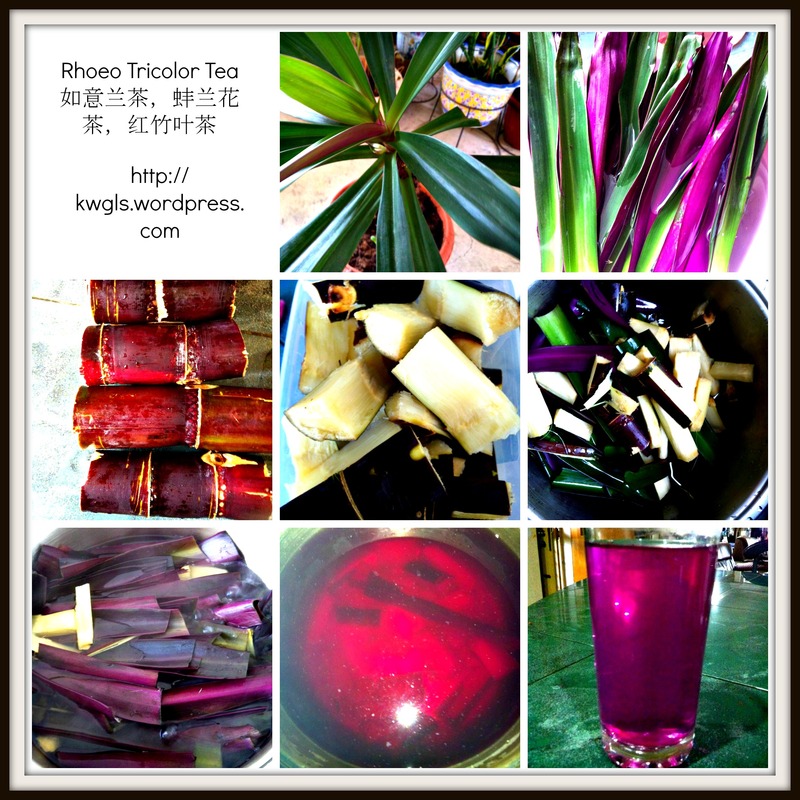 This entry was posted in Drinks, Food Preparation Series and tagged 8, CHINESE, Chinese tea, cold drinks, Drink Preparation Series, GUAI SHU SHU, Guaishushu, kenneth goh, malaysia, postaday, rhoeo, Rhoeo tricolor, 如意兰，蚌兰花，荷包兰，8， singapore. Bookmark the permalink. Came across your fun and informative blog whilst looking for this delicious purple tea, which my mum used to make for us as kids. Thank you so much! Keep up the fabulous ‘work’.